Buy Cheapest Twitter Retweets - Instant Delivery! 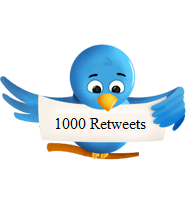 Unlike the other sellers or services that are available out there, we provide with 100% real retweets. No use of any kind of bot activities. When you buy Twitter retweets from us, you can actually promote your account naturally and get recognition from real users on Twitter. If this is what is bothering you then you should know that this is never going to happen. The re-tweets you bought from us will stay with you as long as your profile still exists. If they ever drop then you can easily contact us via our contact page and claim for free replenishments. You see it’s that easy. Yes, it is 100% safe and reliable. We tend to use only the safest methods and strategies that comply with the policies so, there is no need to worry about anything. While you focus on the growth of your Twitter account we will be doing our job to push your account on the top so that maximum number of people can see it. We give high regard to your private information. We will never ask for your account password or for any personal information. Your username and email id will not be shared or used for sale or other similar purposes. All your information is completely safe with us. There is also SSL protection to keep our clients’ private and confidential. How fast will I start receiving the retweets? You will be receiving your retweets a few hours after you complete the transaction process on our website. In case if you see that nothing is happening even after 24 hours then you are free to contact us and we will be there to help you out. To facilitate quick pay that is reliable, easily accessible, and available around the globe, we use PayPal and coinpayments.net. You can buy real Twitter retweets using any of the options that is more convenient for you. We guarantee secure and safe transactions through our payment systems. What makes a tweet go viral? It’s not just about the content that’s in it; it’s also about how many people read it and retweeted (and liked) it. Interacting with people is essential in social media platforms. People engage with each other through the retweets; they retweet tweets and share awesome information with their network. If you tweet the information regarding your product, then retweets will allow you to interact with potential clients. Retweeting is essential for establishing the network of potential customers. People will not retweet your tweets every time; that is why you need to buy cheap twitter retweets. How will top tweets help my business & my sales? Let's take an example; If you are selling a watch and tweeting about it, then your tweet will vanish for sure. However, if you buy twitter retweets, then thousands of people who are looking for a watch will see your tweet in the first place on twitter search. Retweets are the only way to make your tweet as a Top Tweet. Twitter profiles are useless without followers and retweets. There is no benefit of tweeting all day and no one reads your tweet. With the help of our services, your profile will be visible to a lot of people. If you get a lot of retweets, you can be sure that as more viewers catch on, they will want to see who originated the tweet in the first place. As a result, more people will go directly to your profile page and at least some of them will want to start following you to see what else you have to say (or have said). Buying retweets is the proven way to increase your follower base and reputation on Twitter. Search Engine Optimization (SEO) is imperative to marketing and business success. It’s what makes it easier for individuals to find you on their favorite search engines too. When your tweet has a link in it and it gets retweeted, that tweet will end up getting transferred over to social signals that will ultimately help with your SEO. You definitely want that to happen! Getting traffic and sales is really difficult these days due to the competition. But you can outrank them by getting real marketing at cheap prices. The more people who like what you have to say, the more they will tell others (i.e., retweet you) and the more credibility you will begin to gain. The more credibility you get, the more interest individuals will have and the more likely they will be to check out your website, other social media platforms. And, even better - purchase what you have to offer. Twitter Retweets Overall rating: 4.6 out of 5 based on 19 reviews.